We are what we eat, as the promoters of every fad diet and “cleanse” program tell us. What we eat affects the composition of our body. What we eat affects what activities we have the energy and ability to do. What we eat affects our short and long-term health. in the passage we just heard from the Gospel of John, Jesus said that his disciples are to eat his flesh and drink his blood. A startling, shocking image. For almost 2000 years the Church has taken this saying, along with the stories of the Last Supper in the other Gospels and Paul’s description of the worship of the earliest Christians, as the foundation of the sacrament of Holy Communion. I don’t know how Holy Communion works on a literal, physical level, transforming our very bodies, though the older I get the more convinced I am that it can and does, though the physics and the the biology of the Holy Spirit are beyond our scientific understanding. We are what we eat and just like any other special diet, regularly ingesting Christ’s Body and Blood changes us, body and soul. How can eating a few calories of bread and a sip of wine once a week change our body? It’s not just about the wheat and the grapes. Just what body are we eating? We are eating Jesus’ body. It is the body he offered up to God’s purposes in his ministry and also in his suffering and death. That is what we are ingesting, that body given up for others. Sort of like a yogurt culture or yeast or some fermentation agent, we are taking into ourselves an agent of growth and change. Just as what we eat affects our actions, when we consume the Body and Blood of Christ, what we take into ourselves affects how we act. What intentions we have. When we take Communion, we are choosing to be connected to a larger Body. We are expressing our desire to become like the One we’re eating. As we ingest the Body of Christ and are connected to the Body of Christ, if we offer ourselves up to God, as the raw ingredients of God’s Body, we can find ourselves and our our habits transformed. 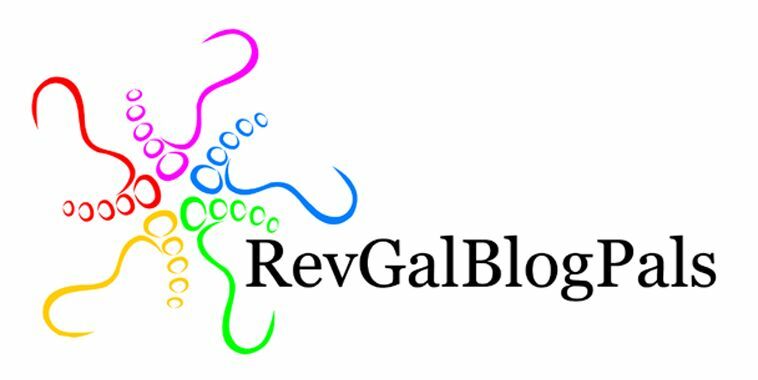 We can become more able to lay aside immaturity and walk in the way God would have us walk. We become more aware of the ways we have fallen short, but simultaneously we are enabled to transcend those things and persevere in spite of them, slowly made wiser and more humble. It is not instantaneous. It can take years. But slowly God takes the raw ingredients that we have offered to God, and makes it into something new, and tempers it in the heat of challenge and struggle, and breaks it open, and offers it to feed the world. We are slowly transformed into living a life which has potential of making a difference, a life with greater depth and connection. We find ourselves organically bound to the Body of Christ—that Body is not only the flesh and blood Christ who lived in Palestine and the body which dwells now still alive with God, but the Body of Christ is also all our brother and sisters in Christ—those we worship with, those in other congregations, those in other parts of the world. God feeds and nourishes us through this enfleshed body just as he feeds us in the bread and wine. This week across the Episcopal Church we are remembering the life and death of Jonathan Daniels, an Episcopal seminarian at our seminary just up the road in Cambridge, Massachusetts, who was killed fighting for Civil Rights in Alabama when he was 26 years old, exactly 50 years ago this week. Given the other half of my position, as director of the Jonathan Daniels House, I would be doubly remiss if I did not speak about him this morning. We may not all be called to a witness as bold and final as Jonathan’s. I hope not. But the way God worked in his life shows the same basic pattern that I’ve been describing, —taking, reshaping, blessing, breaking, giving. Some of you know Jonathan’s story, but some of you may not. Jonathan was a fairly sheltered son of a small-town doctor in essentially all-white Keene NH. Thanks to some rather romantic ideas about the South and the military from some family connections, he chose to attend Virginia Military Institute for college. For those of you who are not familiar w/ VMI, it is the state-supported military academy in Virginia, where Civil War Confederate General Stonewall Jackson was a professor before becoming a legend. Its plebe year, or Rat Year, is still notoriously difficult, making Plebe Year at West Point look like a walk in the park. In the late ‘50s, when Jonathan entered, no one would have considered it a liberal place. He graduated from VMI as valedictorian, then spent some time in graduate school at Harvard. As a teenager Jonathan had considered a call to the priesthood, but in college he left the Church and Christianity. While in graduate school he had a reconversion experience which brought him back to the church and to his call to priesthood, and he entered seminary. While in seminary he did his field education in Providence, in an urban outreach program funded in part by the diocese, in part by the larger church, and in part by a coalition of parishes including this one. It was his work in Providence—where he interacted with blacks for the first time in any meaningful way –that he would spend entire weekends tutoring children, and going into the neighborhood meeting people and trying to support them—that his heart was opened to the civil rights struggle, and he joined the NAACP. The bookish PhD student from Harvard now said he could see himself happily becoming a slum priest. 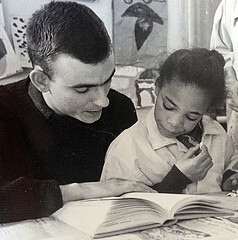 Jonathan Daniels tutoring a child at Church House, Oxford St., Providence, RI fall 1964. When Dr. Martin Luther King asked white Northern church leaders to come to Selma to help in the voting right struggle, Jonathan and a few of his classmates from seminary responded. When most of the other white activists returned home, Jonathan and another classmate stayed. He lived with a black family in the projects. He tried to integrate the large prominent Episcopal church in Selma, getting himself in trouble with the local bishop. One day he and some other activists and locals were protesting for voting rights in a small town in Alabama and they were all arrested. As they endured squalid conditions at the jail, Jonathan’s strength from enduring similar hardships at VMI enabled him to encourage the others and lead them in hymns and prayers. A week later they were released in the middle of the day. They went to a nearby store to buy a cold drink, where they had been before as a mixed race group, but this time they were met at the door by a deputy sheriff, who brandished his shotgun at the black teenage girl standing in front of Jonathan and screamed at them to get off the property. Jonathan pulled the girl out of the way as the shotgun went off, and the blast killed Jonathan instantly. and used them to make him a force for change—both in his life, and in his death. Yesterday I watched the webcast of the pilgrimage and prayers and worship service in Alabama commemorating the 50th anniversary of his death, and the deaths of those others, black and white, who also died in Alabama in those years in the fight for civil rights. Some were beaten by Klan members, some were shot by policemen—the stories had more resonance with current headlines than we’d like. I lost fear in the black belt [Alabama] when I began to know in my bones and sinews that I had been truly baptized into the Lord’s death and Resurrection, that in the only sense that really matters I am already dead, and my life is hid with Christ in God. I began to lose self-righteousness when I discovered the extent to which my behavior was motivated by worldly desires and by the self-seeking messianism of Yankee deliverance! This entry was posted in Sermons and tagged Communion, Good Shepherd Pawtucket, GRB Sermon, JDH, John 6, Jonathan Daniels, Prop 15, Yr B on August 16, 2015 by gillianbarr.